A cool instant messaging application. Chit Chat 4.3.2 is chat & instant messaging software developed by Hosney. 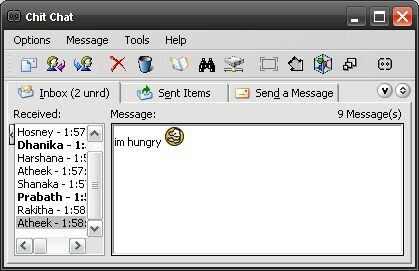 Chit Chat is a powerful yet user friendly instant messaging tool that is based on the Messenger Service running on Windows. (The "NET SEND" command for DOS) It also has some extra features other than this like AI, Share Access Notification, Pinging etc. It provides an easy to use interface with an address book, groups, forwarding and replying, picture emoticons, transparency, configurable interface and all that, that really make quick messaging easy, and FUN! This chat & instant messaging software is freeware, which means you can download and use Chit Chat 4.3.2 absolutely free. There's no need to buy the product. Chit Chat 4.3.2 supports different languages (including English). It works with Windows XP/Vista. We have tested Chit Chat 4.3.2 for spyware and adware modules. The software is absolutely safe to install. We has completely tested chat & instant messaging software Chit Chat 4.3.2 many times, written and published the interesting article and uploaded installation file (3958K) to our fast server. Downloading Chit Chat 4.3.2 will take minute if you use fast ADSL connection.